A good cut from near and far alike. To cover every application from forestry work to the home, garden, DIY and firewood cutting, the Einhell product range contains plenty of different chain saws. The pole-operated pruner is a small chain saw with a telescopic handle which enables trees and shrubs to be pruned from ground level. There is also a choice of electric, cordless and petrol models. Petrol chain saws are mobile powerhouses for challenging forestry work. Electric chain saws are lighter, quieter and work with no emissions, which makes itself felt when used in enclosed spaces in particular. 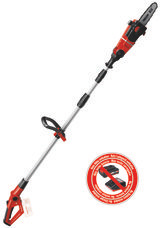 Cordless chain saws combine the advantages of electric chain saws with cordless flexibility.